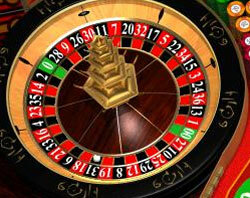 American roulette (or 'double-zero' roulette) differs from its European counterpart in the number of zeros. This significantly affects the player's odds as it makes the house advantage higher in the American roulette - 5.26% instead of 2.63% in European roulette. The wheel in the American roulette is slightly different from the European roulette wheel in the arrangement of black and red color numbers. The arrangement of numbers here is selected in order to create balance between combinations of red or black, even or odd and high or low. Despite red and black numbers on the wheel interchange, just like in European roulette, sequences of numbers are different. All black and red numbers are situated opposite each other. Two odd numbers are usually changed by two even. All numbers face the outer side of the wheel, while in European roulette they are turned inside. Each odd number is placed opposite the next even number that is higher. The two zeros ('0' and '00') are placed in green color pockets on the wheel opposite each other. The layout in the American roulette also has two zeros placed next to each other in the inside section of the table. The inside or inner section for inside bets has numbers from 1 to 36 on it, while the outer section represents groups of numbers for outside bets - Dozens (first, second and third 12 numbers on the layout) and Columns (three vertical lines of twelve numbers each), Even and Odd, Red and Black, and High and Low (groups of numbers from 1 to 18 and 19 to 36 respectively). The rules are actually no different from the European roulette. The idea of the roulette casino game consists in predicting the possible winning number and making your bets correspondingly. The ball launched by the croupier (dealer) will stop in one of the pockets on the wheel thus defining the number that wins. Depending on your bet you will either take the payout or lose the game. The bets are divided into two kinds - inside and outside bets. Inside bets are more risky ones as they are made on a single number or on a small group of numbers situated close by on the layout. This also makes inside bets more profitable. For instance, the payout for a straight bet on number 5 is 35 to 1. One of the tips for the players to get more chances to win is to make outside bets in the first place. These bets are made either on larger groups of numbers described above, like Dozens, Columns or High/Low or simply on Red or Black and Even or Odd number. Even as the payout is much less in this type of bets - 2 to 1 or even 1 to 1, the player's bet is more secure as the winning number is more likely to fall into one of the categories chosen than guessed in a straight inside bet.